oh looky! We’ve had a name change! Same sporadic posting but with a new title. Much soup eating has occurred in this house since November. Partly because its cheap, partly because its warming but mainly because its easy. My cooking mojo upped and left for a while and, honestly, it’s not completely back but with soup you get something wholesome, healthy, simple and usually edible. It’s usually the perfect way to meld those random ingredients into a meal. The above soup is tomato and lentil , one that seems particularly versatile and easy to throw together. Just onions, garlic, lentils, tomatoes, some veg stock and some herbs/spices. Nothing complicated. Sometimes I might add carrots or sweet potatoes. Maybe some chopped spinach might find its way in. All good. 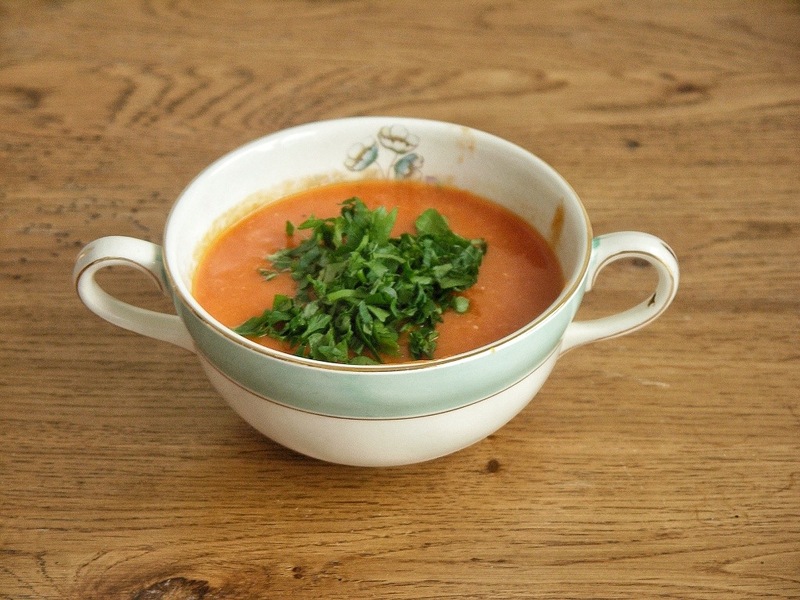 Some other soup ideas are: minestrone, tomato and coconut, lentil and vegetable, roasted root vegetable, leek and potato, lentil and sweet potato, lentil and roast garlic, tomato rasam, Hungarian bean and paprika, courgette and rice (with pesto) or Thai banana and coconut. Do you have a favourite soup? A few days a go I had an overwhelming urge to bake and when this happens baking one thing just will not do. Along with the twice weekly star crackers I decided to branch out and try some of the baked goods from Vegan with a Vengeance. I’ve had this book for many, many years and in all that time I have only ever made the BBQ tofu (very good) and the coconut cupcakes (good but if you leave them overnight they become excellent) so rather than leave it languishing on the shelf I thought I’d give some other recipes a try. lemon cut out biscuits: Not a big success. The dough was improbably soft and never firmed up after chilling. Then they were exceptionally difficult to roll and cut out. They also did not crisp up. I ate them anyway of course. The thumbprint cookies…well, admittedly I have no real idea what a thumbprint cookie should be like but I’m fairly sure this is not it. The dough was, again, so soft it wasn’t possible to roll it into balls so I just dolloped them on the baking sheet. What I got were the most delicious Whoopie pies so I’m not really complaining! Plus I’ll probably make these again and either fill them with icing or dip the whole thing in chocolate. More successful was the banana lemon loaf and an improved version of this homemade bread (improved by not being so damn stingy with the yeast. I did not know that by doubling the amount of yeast I added it would make it taste, well, tastier. This only dawned on me when reading up on making Vegan Brioche on Celine Steens “have cake, will travel” blog. I have always feared that more yeast would just make the bread taste yeasty but no. It does not). On my other blog (The Tasty Herbalist) I talk about seasonal transitions and this seems equally relevant to here. The bounty of late summer has well and truly made way for the sparsity of autumn and any heat from the sun has long faded. Traditional autumn fare reflects this change in the seasons where food is now about providing warmth and nourishment (I like to think of autumn and winter as semi hibernation). The focus should be on starchy root vegetables, robust greens, slow cooking, dried and preserved foods and fat. This is certainly what I want when the light levels dip and the temperatures drop. I want steamed puddings, roasted vegetables, gravy, toasted nuts and seeds, dumplings and mashed potatoes. I want shepherds pie and stews. I want to stuff vegetables with other vegetables. I want to eat toasted crumpets and fruit cake and wash it all down with my be-teacosied teapot. I must admit I have gone a bit crazed with the vegetable buying and it’s like a pagan harvest festival has exploded in my house. No bad thing. It can feel like autumn and winter is a sea of brown, like the colour has been drained out the landscape but it is also the time of year of bright green vegetables and the vibrant oranges of the squashes. Autumnal food gets a bad rap, a lesser cousin to the more vibrant summer foods but really, what’s not to like about a warming shepherds pie with the multitude of variations available. Should it be bean, lentil, nut or root vegetable based? Will I top it with potatoes, sweet potatoes, polenta or a mix of root vegetables? Do I want it gravy-like or in a tomato base. So many options. So lets sing the praises for those gnarly roots and sturdy greens, and pass the gravy. Thirty one days of MoFo. We did it! What can I say, I thoroughly enjoyed it! I did cheat though and only wrote 23 posts, with Hannah and Lucy very kindly stepping in for the weekends, and I have utmost respect for everyone who managed it on there own. MoFo is challenging but, I feel, for all the right reasons. Personally I enjoy a challenge once in a while and I saw it as a motivator to boost my creativity. What came out of MoFo was the realisation that I have plenty ideas but not always the time (currently) to act upon them and that’s OK, the time will come. It also crystallised some thoughts and ideas I had buzzing round my head , boosted my creativity in other aspects of my life and forced me to be more organised and productive. MoFo also introduced me to some fantastic new to me blogs in the UK (hello Vegan in Brighton and Tea and Sympatico! *waves maniacally*) as well as a multitude of Global blogs. I’m still catching up with them all and maybe I’ll be done by the end of the year. If I get the time I’ll do a round up of my favourite posts and blogs. So, what usually happens now is I regress to posting sporadically and guiltily but not this time! I’m not saying I’ll be posting every day but once a week most definitely. (Because there might not be any strict pattern to the posting subscribing to the rss feed, twitter or emails is always a good option). So here’s cheers to another good MoFo and I’ll raise a glass of peppermint hot chocolate topped with a flaxseed marshmallow fluff (found via this vegan meringue post by the incredibly innovative Wing-It Vegan). Vegan MoFo: Happy New Year! Contrary to what you might think I have not gone mad…although 31 days of MoFo could do that. Samhain, or Halloween, is the old new year and I feel entirely happy adopting it as my own. So much better than the usual New Year, or Hogmanay as it’s known in Scotland, where the purpose is to get hammered. The old New Year begins at dusk so I guess that technically it’s not the new year yet…but lets not get pedantic. A Traditional part a of new year is making resolutions but more recently I prefer goals. Goals can’t be broken and are something to strive towards where, as everyone knows, resolutions are made to be broken. 1) Work more wheat free meals into my diet. This isn’t because I have any allergy or intolerance and I have no intention of giving up wheat at all but with toast for breakfast, couscous for lunch and pasta for dinner ,well, even I can see it’s verging on excessive. It’s far too easy an option and wheat is pervasive, sneaking into so many things. Variety is good, it is the spice of life after all, so I must expand my carbohydrate repertoire. Just not too sure how yet. 2)Eat as seasonally as possible. You know…without being too precious about it. I am a major proponent of seasonal eating and we already do our bit but I’m all for more! I truly believe that eating produce which is appropriate to your season is healthier for you. There are many reasons why, in the northern hemisphere anyway, we should eat roots in autumn and winter and fresh leafy salads in spring and summer. I know that automatically I am drawn to warmer, earthier meals in the winter months and lighter, cooler foods in the summer. That’s not to say that salads can’t be eaten in winter but base them on carrot, beetroot, cabbage and celeriac rather than tomatoes, peppers and lettuce. Anyway, before I get off topic, seasonal foods shall be increased…except lemons. I can’t not have lemons! 3) Get back to preserving. I love having a cupboard full of pickles, chutneys, jams and other preserves. Others might find it pointless and time consuming but I find it calming and a necessary part of connecting me to the seasons. Also, it’s a sneaky way of eating unseasonal fruits and vegetables legitimately without them being in season! So those are my food goals for my new year. Have you any goals for the new year? Scones and pancakes are the two quick makes I turn to when we are all needing a little something in the afternoon to accompany our pot of tea. Neither are particularly sweet but they make a good vehicle for jam or conserve. The scones use few ingredients, none of which are unusual, which makes them easy to put together. They do need a light touch and quick handling so that they rise nicely. I don’t even start to mix everything until the oven is heated and I keep the margarine in the fridge until the last minute to keep it as cold as possible. This also makes for lighter fluffier scones. Also, do not be tempted to use a rolling pin. Just flatten, a very little and gently, with your palm. I should probably apologise for the recipe being in ounces but it’s the recipe my mum used, the one I’ve used all my life and it’s much easier to remember the quantities. Heat the soya milk very gently until blood temperature but not hot. Rub the margarine into the flour until roughly done. It doesn’t need to be like breadcrumbs. Using a table knife cut in the milk (so rather than stirring it you are using a sort of slice and mix action). Pull it gently together with your hands and flatten the top but keep your scones the same height as you want because they don’t rise much. Cut out your scones, place on a baking tray and bake for 15 to 20 minutes or until golden.